Skimmer clam makes great bait and great chum. Watch how they sink, however, and you’ll realize they don’t always take a straight path to the bottom. The more I called around for background material in the Offbeat Baits For Cod article just posted in our fishing section, the more interesting stuff I heard about cod baits and what can be found in the bellies of these beasts. Captain Rob Andresen of the Captree open boats Captree Pride and Captree Princess, for example, spoke of finding rocks in codfish when they hold over rubble-strewn bottom a bit off the wrecks, especially following storms. He figures the cod eat them for ballast but has no explanation for why he’s also found sand dollars in the same fish. 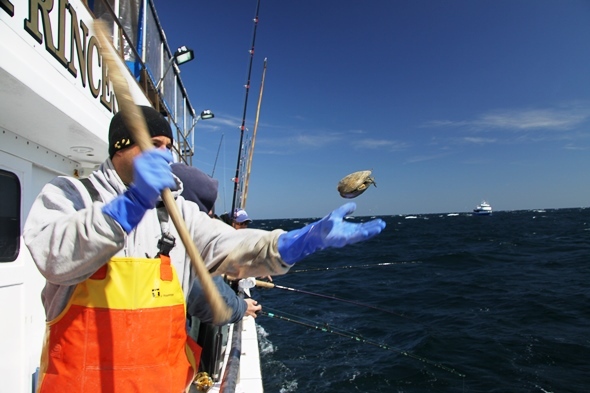 “Sea mice,” large, fuzzy-looking worms that can stretch the tape to over a foot but usually measure three to six inches, are another item Andresen has recovered from cod. It would seem they could serve as a menu item in a pinch being that they have been found from inshore waters to depths of over 6,600 feet. Live mackerel are another meal which this skipper has recovered from fresh caught cod. Back to Capt. Michael Potts of the Bluefin IV for a little more codfish insight: During our discussion, he noted his bait of preference for codfish as being freshly caught skimmers, opened, unsalted and used the next day. Allowing them to sit overnight, he believes, causes the meat to soften just a little bit so it lays better on the hook and doesn’t spin as much on the way to the bottom. He will salt any leftovers after a day or two. For sea bass, however, Potts prefers squid, which he said also catches plenty of cod by accident. Capt. Al Lorenzetti of the Skimmer also mentioned that he likes to use Red Gill teasers for cod, tipped with a little bit of clam. If the fish are skittish, however, he’ll go to a red jelly worm as a teaser. While most anglers thread these up the hook, Lorenzetti prefers to hook jelly worms one time right through the middle. “It’s wacky worm style,” he stated, “just like freshwater anglers use for bass. For some reason, I find that presentation works better than the traditional method when codfishing.” I’ll bet two sea perch, however, that he’s willing to lose a few jelly worms on each trip. 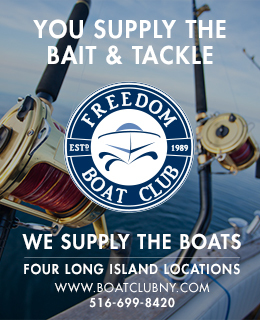 Captain Chris Cullen of the City Island and Snug Harbor, RI, Island Current Fleet, cautioned that anglers shouldn’t be too quick to switch off clam baits for oily fish strips or chunks because they can wake up the dogfish. That said, he has pulled squid, mackerel, herring, flounder and fluke from cod bellies in recent years. As for skimmer clam baits, this skipper believes strongly that fresh is best. Whether on the ice or at the rail the author hates to be cold. Fortunately, Frabill’s FXE Stormsuit has helped him level the playing field with Old Man Winter. 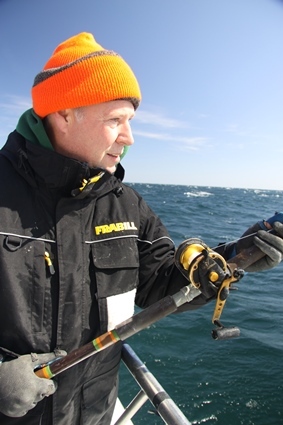 One other general thought on codfishing: dress for battle with waterproof gloves, a knit hat, thermals, boots and plenty of layers that you can add on or peel off. For the last few years, I’ve been using a Frabill FXE Stormsuit originally designed for ice fishing in cold northern and Midwestern areas. It’s worked great! The suit is tough, easy to clean, reinforced at the knees and elbows, and exceptionally warm so I can stand at the rail as long as anyone. The longer you stay at the rail, of course, the better your odds of limiting out or winning the pool. Yes, it’s expensive, but you might recoup your expenditures in pool earnings over the next few years and, when you really get down to it, being warm is worth the investment. All’s quiet on the codfish front at the moment but it’s likely that will all change over the next few days. While ice, wind and sub-freezing temperatures have kept boats at bay for much of the past two weeks, many in the codfish fleet plan to sail this weekend through the first week of February. Before the latest polar vortex rolled into town, action was fair to picky on broken bottom and local wrecks. By now, however, these pieces should have had enough time to recharge so there is potential for a decent bite right out of the gate. We are coming off of a January 30 new moon at the moment, so the tide will be still be pushing hard over the weekend. Tides for next week, February 2 – 8, should be pretty favorable. Sea herring were in good supply around Long Island before the cold set up and there’s every reason to expect that action will resume once things warm up enough to free the bays and harbors of ice. Magnolia Pier, 69th St. Pier, Centerport Harbor and Mount Sinai Harbor all held fish as recently as January 10. As usual, Sabiki rigs were the hot ticket. On the sweeter side, a few anglers have reported success with yellow perch and largemouth bass while ice fishing at Laurel Lake and West Lake in Patchogue. Lake Ronkonkoma is also iced over and could provide a shot at walleyes if you can get there and set up with live shiners before the warming trend that looms ahead. I’d be very interested to know how you made out if you hit the big lake – especially with walleye – so go ahead and post-up your results on the Outdoor Tom Facebook page.